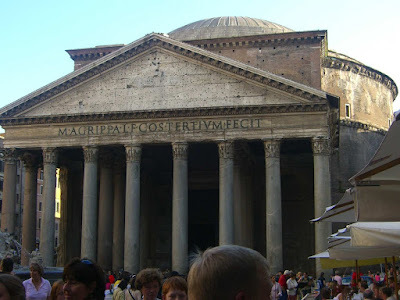 Our second day in Roma found as at the Pantheon mid-morning. Not one to resist a fancy food shop, I made a mid-morning snack out of a prosciutto, mozzarella, and tomato panino from a shop in the Piazza della Rotonda. 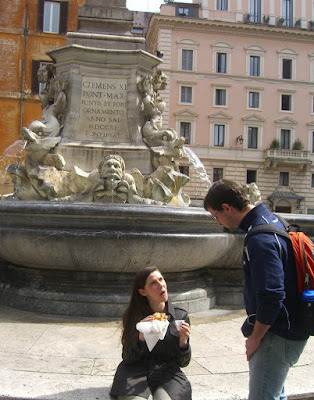 We strolled through the streets of Roma, finding ourselves near Piazza Barberini. 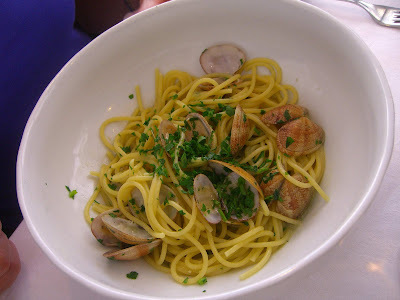 I remembered reading about a highly regarded place nearby, so we took a few turns and found ourselves having an excellent lunch at Hostaria Romana. The restaurant’s picture windows provided a lot of sunlight in the dining room, and we were greeted very pleasantly both by the waitstaff and the tables heaped with various platters of grilled, fried, and marinated antipasti. 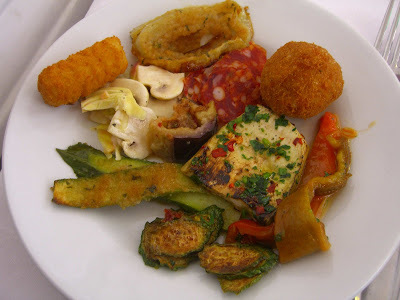 We each got a glass of bubbly and loaded our plates with little tidbits of veggies and cured meats like fried zucchini, arancini, potato croquettes, marinated mushrooms & artichokes, roasted & marinated peppers, roasted and marinated eggplant, breaded and fried onion, salame…. I really do love Rome. Since artichokes were in season, I couldn’t pass up the carciofi alla giudea, even though we’d have them at dinner the night before. 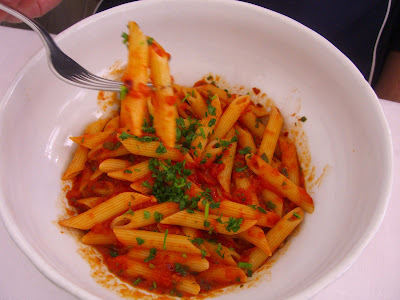 …and penne all’arrabiatta. 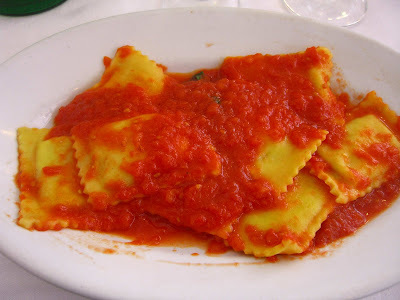 All were simple and exactly what you wanted them to be, and we received the best service of any restaurant we visited in Rome. 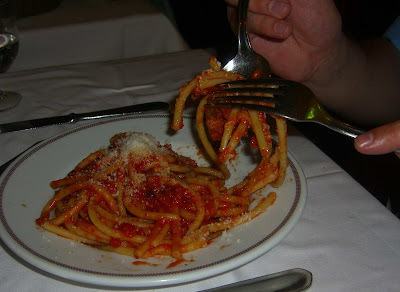 We weren’t so lucky with service when we dined in the Jewish Ghetto at Da Giggetto, and food was hit and miss. 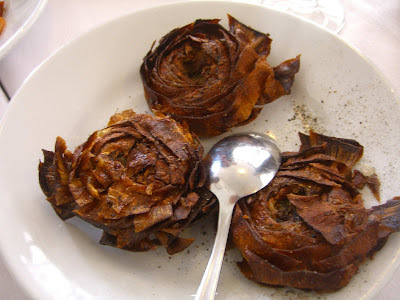 Jewish food in Rome is working class cuisine and the specialties at Da Gigetto are undoubtedly the carciofi alla giudea - that fried artichoke flower I’ve raving about – along with fried salt cold (baccala) and suppli al telefono. We ordered all three for an antipasto. 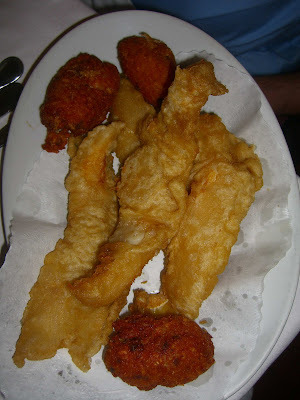 The fried baccala was coated in a batter of perfect thickness and was fried beautifully. 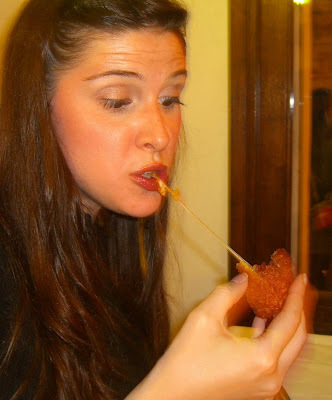 I quite enjoyed the suppli al telefono, fried risotto balls stuffed with a hunk of mozzarella cheese. They are aptly named, as the cheese strings out like a telephone cord when you bite into the little fritters. 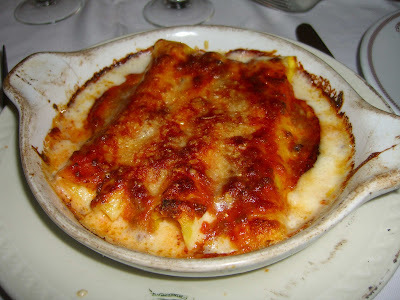 Our first courses were also very good: bucatini alla amatriciana… And cannelloni filled with ricotta and spinach and baked in a gratin dish with béchamel and romano cheese. I thought it was impossible to go wrong with lots of gooey melted cheese, and the cannelloni really hit the spot but Phil’s eggplant and tomato casserole (ordered as a main course) was really just too overwhelmingly cheesy. Gosh, did I just say that? 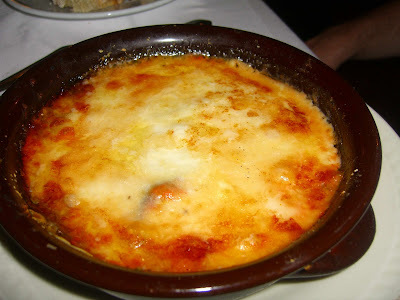 Yes, I swear there was some eggplant and tomato under all that cheesy goo. The fried baccala and suppli were such good fried starters that I decided to go with the fritto misto, mixed fry, for my main course. Heck, I’m only in Roma every once in a blue moon, I can eat as much fried food as I want!! Well, I was so disappointed in this fry that it makes me wanna cry. Ugh. There was just no love whatsoever put into this greasy mess. I had been so pleased with the batter coating the fried baccala, but the batter for the mixed fry was certainly not from the same batch. It had no seasoning and was soggy and made the zucchini and mushrooms very limp and to top it off wasn’t even hot when it arrived at the table. And should I even mention the fried lambs’ brains? I actually quite like lambs’ brains (the ones I ate at The Salopian Inn in McLaren Vale come to mind) and was excited to try them here, but all I can say is EEEWWWWWWW. Like a whiny little kid. Ew. They were gray. And grainy. And the texture was awful – they just dissolved away into a mucus mess in my mouth. Laurie’s lamb chops were almost – almost – as bad. They had the lowest meat to bone ratio I’ve ever seen, and most of the “meat” was actually inedible fat. 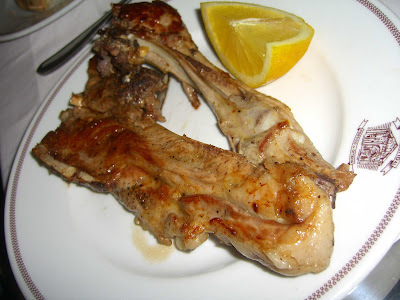 The lamb didn’t even seem of a good quality – it was the greasy stuff that leaves a film on roof of your mouth that doesn’t seem to go away even after a good tooth brushing. The service was at best slow and at worst nonexistent, but hey, that’s what you get in Roma. You can’t let it bother you or you’ll never enjoy a meal. What bothered me was the quality of the main courses we ordered. 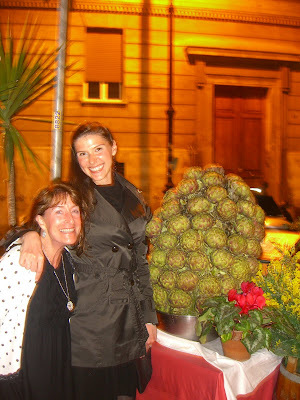 Being tourists, I guess we just didn’t realize that when you come to the Jewish ghetto, you eat Jewish artichokes, and you eat fried baccala. Don’t make the same mistakes we did. I suppose the restaurant couldn’t have been more clear about its specialty – check out the artichoke display on the sidewalk outside the door. Final verdict: don’t bother with the main courses. 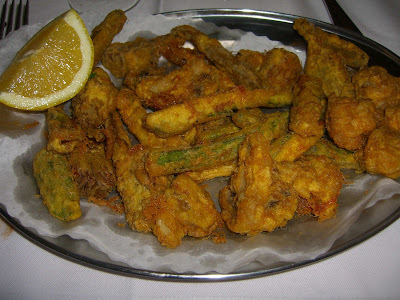 Fill up on fried goodies: carciofi alla giudea, suppli, bacala. And wine, if you can get that waiter’s attention.